Superman foils a bombing attempt by Toyman, but it’s actually a trap to blow up Superman. All it does is send him flying back to Earth outside of Smallville, but with amnesia. He befriends two hobos who are running from bad lives (but not the mob or the cops), and sees firsthand how the people treat them. And yet they try to help when a drunk driver hits a car, a little girl trapped underneath it, even though the boys and the girl’s mom all mistreated them earlier. During the rescue Superman’s memory is restored as he saves the girl. 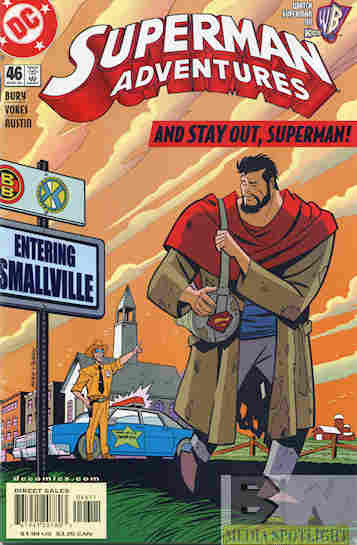 Since they’re friends with Superman a farmer they met earlier offers the hobos a job with room and board. It’s all who you know. What they got right: Give the people credit. They may be jerks to the hobos but the boys try to save the little girl. This is Superman’s hometown and Clark learned his values somewhere. Even the hobos, although they steal to survive (which even with amnesia Superman can’t bring himself to do and talks them out of it), try to help the accident victims. Seeing the best of humanity in action is what a Superman story should do, even if we see the worst. What they got wrong: Otherwise, the story feels a bit lite. I’ll even give Bury the benefit of the doubt and say it was by necessity but this wouldn’t have made it as an episode, which I think was a problem with the direction this series took and why it lost me. I think the hardest part is thinking Superman would get amnesia from this when he’s been smashed through whole cities by this point. Recommendation: Not a must-own issue but not a bad one to get an idea of what makes a good Superman story in concept and how people around Superman should be depicted. Again, Superman stories don’t just showcase the best of Superman but the best of people in general, even if it shows they aren’t perfect angels either. Posted by ShadowWing Tronix on April 8, 2019 in Animation Spotlight, DC Spotlight, Television Spotlight, Yesterday's Comics and tagged DC animated universe, DC Comics, DCAU, Superman.